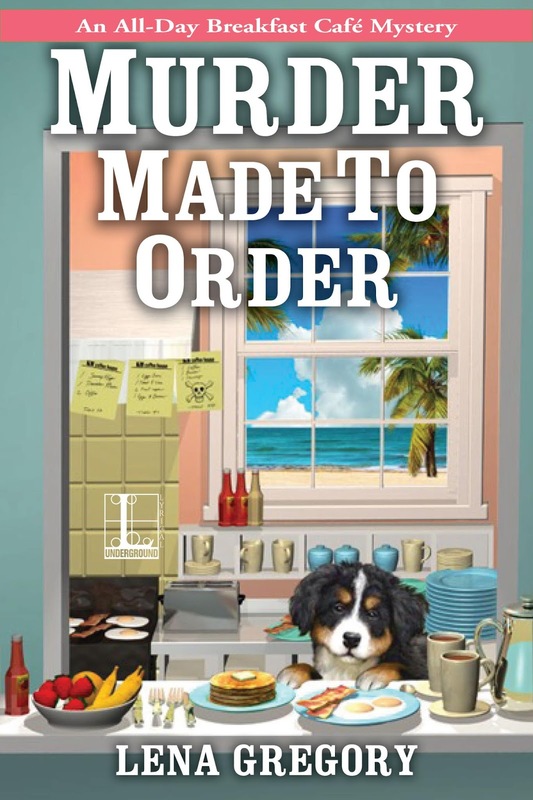 To save her cozy Florida diner, Gia Morelli must choke down a heaping helping of murder . . .
A few of your favorite things: Chocolate, soft blankets, big dogs. Things you need to throw out: Old notes and paperwork. Things you need in order to write: Quiet, Diet Coke, chocolate. Things that hamper your writing: Chaos, noise, having things on my mind. Things you love about writing: Creating new characters and bringing them to life. Things you hate about writing: Writing a first rough draft. Hardest thing about being a writer: Waiting! I’m not a patient person, and waiting on submissions is tough. Easiest thing about being a writer: Chatting with other authors and readers. Things you love about where you live: Family, friends, beaches. Things that make you want to move: Winter. Things you never want to run out of: Diet Coke and chocolate! Things you wish you’d never bought: Nothing. I’m pretty careful about purchases. Words that describe you: Happy, content, honest, hard-working. Words that describe you but you wish they didn’t: Impatient, insomniac. Favorite foods: Beef Stew, pork roast, meatballs with sauce. Things that make you want to throw up: Wet food in the sink, wet hair in the drain. Music that make your ears bleed: Opera. Something that gives you a pickle face: Sour gummy worms. Favorite smell: Baby powder, Tate’s cookies baking from the cookie factory. Something that makes you hold your nose: Fritos! Something you’re really good at: Dancing. Something you’re really bad at: Singing. Something you wish you could do: Sing. Something you wish you’d never learned to do: Wash dishes. Something you like to do: Play with my kids. Something you wish you’d never done: Ridden a roller coaster. Last best thing you ate: Chicken salad sandwich on whole grain bread. Last thing you regret eating: An ice cream cone. Things you’d walk a mile for: Anything; I enjoy walking. Things that make you want to run screaming from the room: Spiders and snakes. Things you always put in your books: Big dogs. Things you never put in your books: Real life people. Things to say to an author: I enjoy your books. Things to say to an author if you want to be fictionally killed off in their next book: Writing books sounds easy. Favorite places you’ve been: Disney World. Places you never want to go to again: Out in a boat on the ocean. Favorite books: Lord of the Rings, Gone With the Wind. Books you would ban: None. Favorite things to do: Hang out with my husband and kids, read, watch superhero shows and movies. Things you’d run through a fire wearing gasoline pants to get out of doing: Going to the dentist. Best thing you’ve ever done: Getting married, having my kids. Biggest mistake: Not going to school to be a teacher. The last thing you did for the first time: Binge watched a series. Something you’ll never do again: Ride a roller coaster. Lena Gregory is the author of the Bay Island Psychic Mystery series, Death at First Sight, Occult and Battery, and Clairvoyant and Present Danger, which take place on a small island between the north and south forks of Long Island, New York, and the All-Day Breakfast Café Mystery series, Scone Cold Killer, Murder Made to Order, and Cold Brew Killing, which are set on the outskirts of Florida’s Ocala National Forest. Lena Grew up in a small town on the south shore of eastern Long Island, where she still lives with her husband, three kids, son-in-law, and five dogs.